In February, Te Papa opened a commemorative display, Remember: the Canterbury Earthquakes, to mark the fourth anniversary of the devastating 2011 quakes. 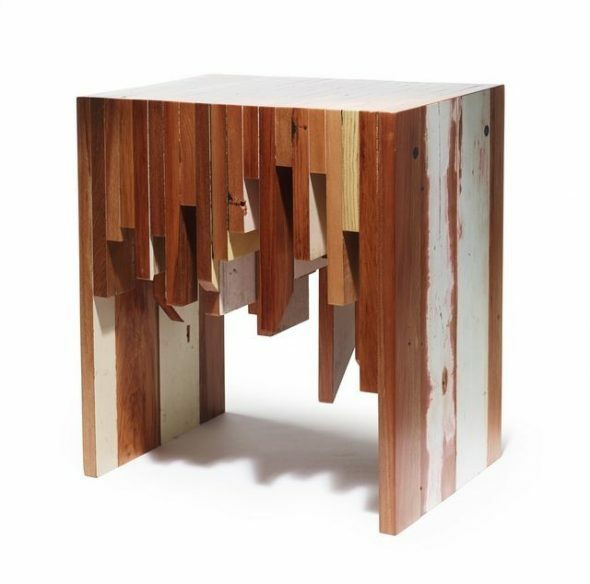 The display features two pieces of furniture by Rekindle, a social enterprise committed to unlocking the qualities of undervalued materials, and in particular Christchurch’s demolition ‘waste’. Offcut Side Table by Rekindle, 2013-14. Te Papa. Purchased 2014. Provence is important to Rekindle. This table is made from wood sourced from 28 Cowlishaw Street, 28 Fleete Street, 512 Avonside Drive, 30 Morris Street, and Surf Shop New Brighton at 7 New Brighton Road. Although Rekindle acknowledged that the reuse of materials is not always easy – ‘they are not predictable like the fresh, straight, un-punctured timber at the hardware store’ -, over 250 makers, from professionals to retired experts, family groups and school children, took up Rekindle’s challenge. The inventive results of the Whole House Reuse Project are currently on display at the Canterbury Museum in Christchurch. Over the last year, 19 Admirals Way has been transformed into jewellery, toys, tableware, furniture, a backyard studio and even a range of musical instruments, including a delicately carved taonga puoro (flute) by master carver Brian Flintoff and a special brand of ‘House Music’. Speaking at the opening of the exhibition, the Buxton family, who had lived at 19 Admirals Way for six years, were clearly moved by the project. On the evening of 24 August, many of the items from the project will be auctioned at a fundraising event at the magnificently restored Isaac Theatre Royal in Christchurch. Anyone is welcome to bid on a one or more of the amazing objects crafted from 19 Admirals Way. The items will be on display at the Canterbury Museum until 23 August, and can also be viewed online at Whole House Reuse. Tickets for the auction can be purchased from Ticketek. Proceeds from the evening will go towards Rekindle’s next project – a partnership with Kilmarnock Enterprises, an organisation committed to employing individuals with intellectual disabilities. Working with designers interested addressing waste streams, the project will aim to produce sale-able products that take into consideration the social and technical strengths of the Kilmarnock Enterprises.